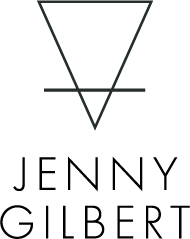 I love receiving ideas for bespoke wedding rings, engagement rings, birthday presents, bridesmaids jewellery...or even something you've always wanted for yourself. It gives me the opportunity to do something new and exciting and turn your ideas into a reality. Contact me for a free design consultation. No commitment necessary. Very dainty 18ct rose gold with a tiny ethically sourced Brazilian emerald. Sri Lankin marquise sapphire with two white saltwater pears. Set on top of a double square band in 9ct yellow gold. 14ct cast gold with three white diamonds. Designed specially for a very talented interior designer. To be worn three ways - to show one, two or all three diamonds. A special 30th birthday commission for a very special lady. Made with natural smithsonite and 9ct gold. Pearl drop earrings for a pearl anniversary. This bespoke necklace is made using 9ct Rose Gold and a free form rose cut rainbow moonstone. It was commissioned by a Mother as a gift for her daughter's 30th birthday. We talked on the phone, sent ideas back and forth and discussed sentimental ideas for the piece. 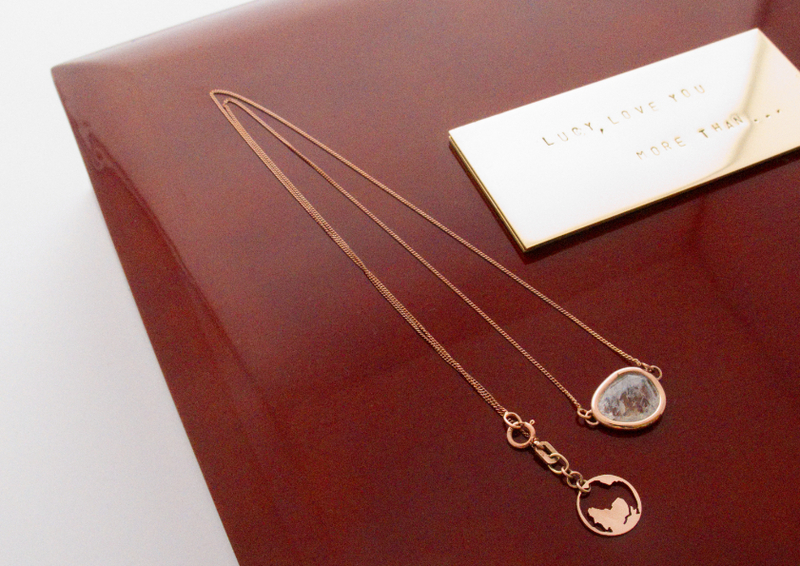 We decided to make a necklace based around something she used to say to her daughter - "I love you more than...the whole wide world". Eleven friends wanted to buy a bespoke keepsake for Charlottes 30th birthday. They wanted something sentimental that symbolised their friendship. There are eleven initials on the inside of the band, and eleven granulated balls of silver on the ring - one for each friend! 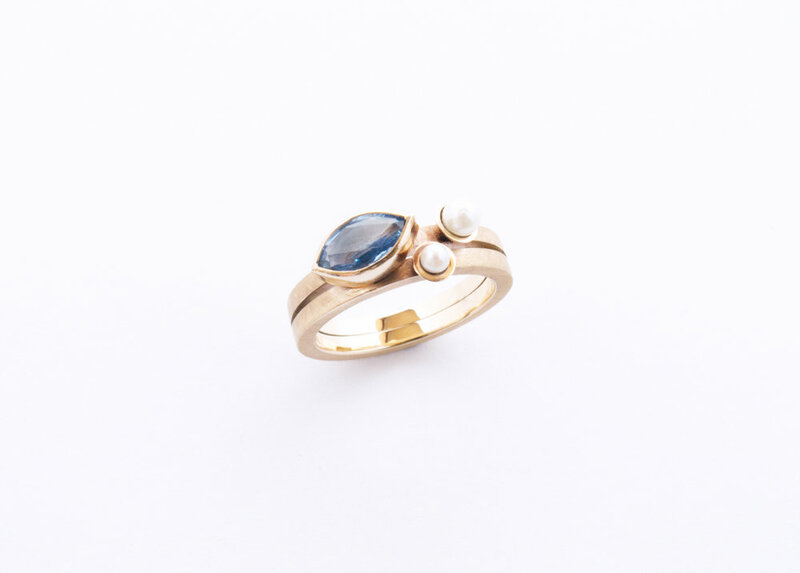 The stone is a moonstone which is the birthday girl's birth stone. I had so much fun making this piece! 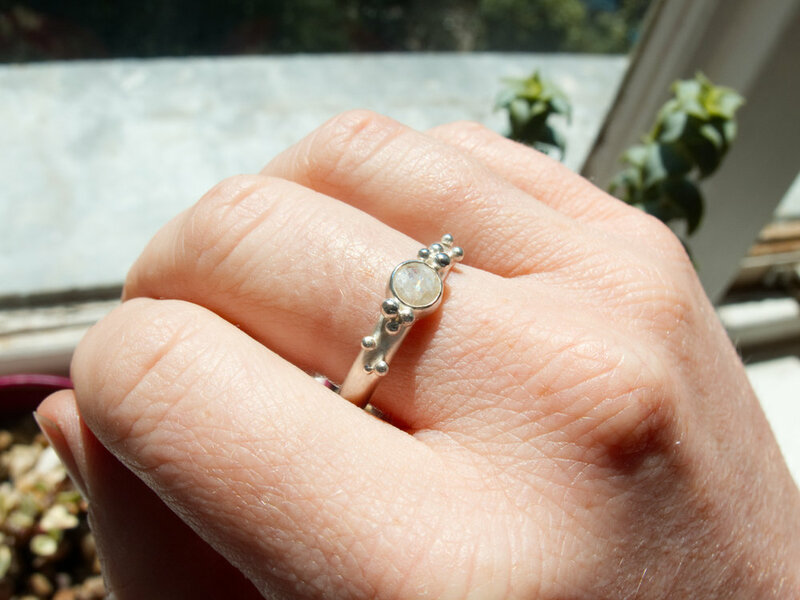 Bespoke sterling silver and rainbow moonstone ring with granulated detail being worn. Bespoke 9ct White Gold and Freshwater Pearl Engagement ring with Rose Setting. A side view of the peony ring. Matching rings for a mother and daughter; big pearl, little pearl; open lotus, budding lotus. This is my favourite kind of commission. Ring 1 of 2. A ring design based on the recipients favourite flower - a peony. Given from a boyfriend to his girlfriend on her birthday, made using recycled silver and a freshwater pearl. Matching rings for a mother and daughter, ring 2 of 2.